Irina Stachinskaya was born in Moscow in 1989 to a family of distinguished musicians. In 2010, she graduated from the Russian Academy of Music ‘Gnessin’s’ where she studied with Professor Vladimir Kudrya. Aged 17 years old, Irina won the position of Co-Principal Flute in the Moscow Philharmonic Orchestra in 2006. Prior to this appointment, she gained her first job as Principal Flute in the Moscow State Symphony Orchestra when she was only 14 years old. She also maintains a busy schedule of solo and chamber music performances with a variety of programs in prestigious concert halls throughout Moscow. Irina participated in a concert with Davide Formisano and Cameristi della Scala in Tchaikovsky Concert Hall in Moscow. In 2009, her ensemble ‘KUI’ Trio (flute, harp, viola) was awarded the ‘Golden Trophy’ in the 2nd International Web Concert Hall Competition, New York – USA. Irina has also been the recipient of other prizes including 1st Prize in the “Classical Heritage” Competition, Moscow (2004) and 1st Prize in “Musicalia” Athens (2000). She has repeatedly invited as a guest soloist to the International Festival and Masterclass of Sir James Galway in Weggis and in 2010 became the first winner of the “Rising star” Series prize awarded by Sir James Galway himself. In October 2011 Irina won 3rd prize in the 2nd Maxence Laurrieu Flute International competition in Nice. In addition to her working in the orchestra, Irina is playing as a soloist with different orchestras such as “New Russia” Orchestra (chief conductor Yuri Bashmet), The President symphony orchestra and “New Opera” orchestra named after Eugeniy Kolobov. In August 2014 Irina became a Powell artist. 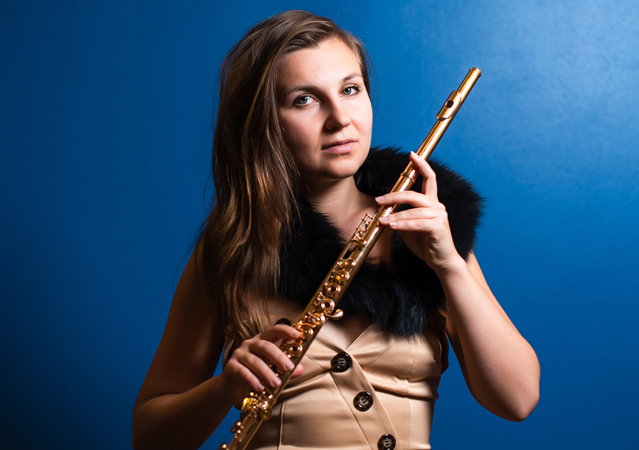 She has performed her solo debut at National Flute Association in Chicago with the famous pianist Phillip Moll and international flute soloist Jean Ferrandis. One year later Irina was invited back to the USA to perform on the Opening Gala concert in front of 2000 flutists from all over the world. Since October 2015 Irina continues her professional education in Ecole Normale de Musique de Paris Alfred Cortot. In May 2016 in collaboration with Phillip Moll Irina released her first solo album under a well-known Russian label Melodia records.